Back in 2004, before YouTube could take a funny looking cat’s face viral, before #HashTags, Reddit and Instagram memes, Burger King’s weird Subservient Chicken became one of the Internet’s first and biggest ever viral sensations. Now he’s back, sort of. The Subservient Chicken, a man dressed in a giant chicken suit complete with a garter belt (??!) – who’d do anything you asked him, as long as it wasn’t x-rated – is back, but he’s missing. The site got 100 million views within two weeks of its launch according to Burger King, eventually netting more than one billion. The stunt took the Internet in a new, interactive direction. And I freely admit that I spent many hours bossing the Subservient Chicken around. The brand followed with a lot of strange promotions that failed to move chicken, but certainly were amusing. 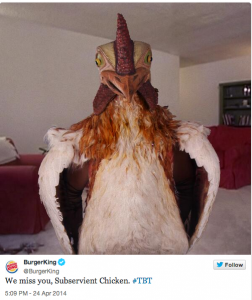 Recently, Burger King’s use of social media consisted mainly of its super creepy King and it Twitter account being hacked. On Sunday half-page ads resembling missing persons bulletins, asking whether readers have seen the chicken, ran in the New York Times, the Houston Chronicle, the Los Angeles Times, the Chicago Tribune and others. 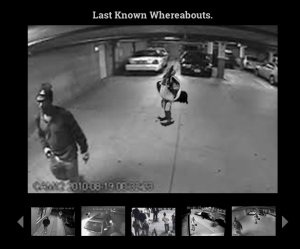 The site also includes photos of the mascot’s last known whereabouts, illustrated surveillance-style via security stills from convenience stores and parking garages. Consumers are asked to help find the chicken on digital and social media channels and to use the twitter hashtag #FindTheChicken. Will it fly in today’s crowded landscape? My bet is that it will. The Barbarian Group and CP+B are not involved in this reworking of the campaign. 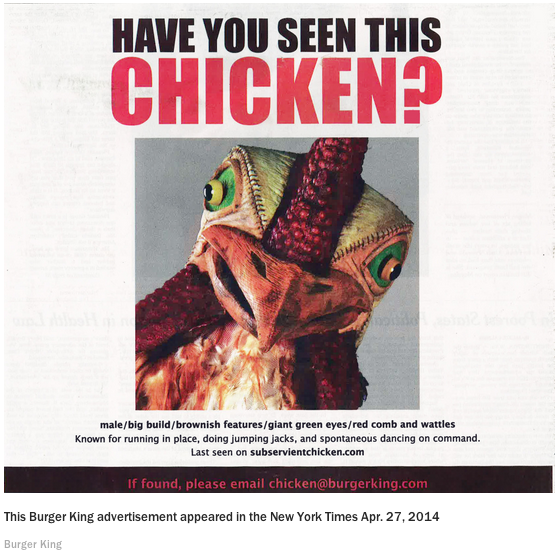 The resurrect campaign, which ostensibly sells BK’s new Chicken Big Chicken, was created by Ogilvy’s David, Code & Theory and Horizon.